A recent southeast Florida algae rally drew a small crowd. U.S. 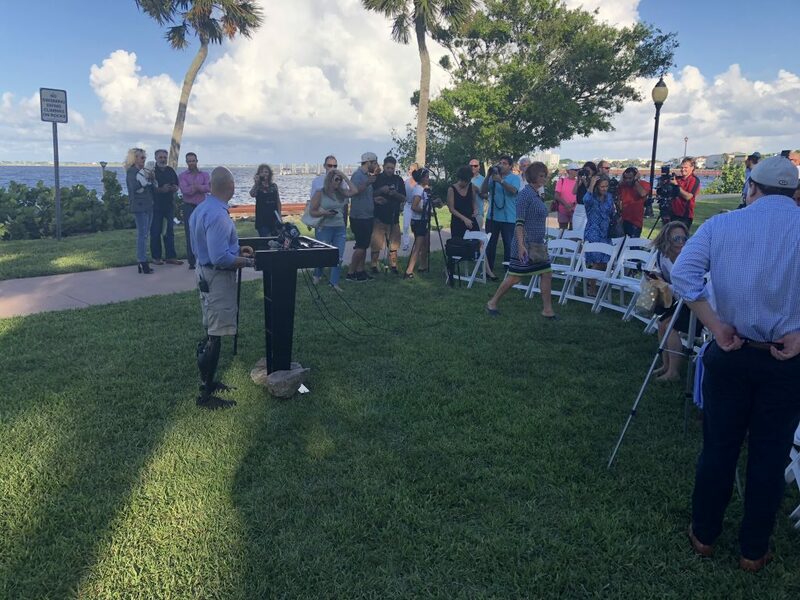 Congressman Brian Mast (R-Palm City) hosted a campaign event in Stuart on Sunday and visited other South Florida areas in recent days. He partnered with anti-farming group BullSugar.org and featured activist Erin Brockovich to help push his recently introduced Stop Harmful Discharges Act in Congress. The first event in the series attracted about 100 people to Flagler Park in downtown Stuart. Those attending included reporters and their helpers, activists and a handful of onlookers. A small crowd gathered at Flagler Park in Stuart, Florida, late Sunday afternoon. In his brief opening comments, Mast stated his bill is designed to make public health and safety for the growing population in his coastal region the priority when it comes to water flows to the east and west of the lake, which he says are causing all the algae problems. 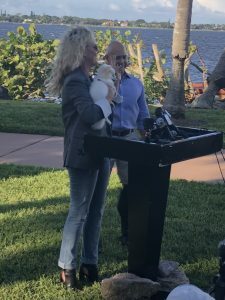 Activist Erin Brockovich and U.S. Rep. Brian Mast attended a media event in Stuart. “The consideration is all about recreation, irrigation, navigation, salt water intrusion prevention, flood control and water for the Everglades,” Mast said, emphasizing his view that residents in his coastal area should be the priority over other considerations. Promoted as a media access event to some, it appeared clear to me the invitation list for the event was controlled. I knew I wasn’t invited, but spent the day traveling there to see what was going on anyway, anticipating that an anti-farming message might rear its ugly head. However, as a farm journalist in search of the facts, I find a few holes in his comments and a few key facts missing. I tried to ask about some of these items at the rally, but aides and the BullSugar.org people, apparently paying for the event in some way, didn’t care to answer my questions. I offered them some brief material and asked for their help to find any inaccuracies in the facts we’re reporting. I promised to report them if they could find them. For example, as in the release at the above link, according to numerous scientific studies, the vast majority of the water flowing to the east and west through the Saint Lucie and Caloosahatchee estuaries comes from those same local watershed areas. It does not come from the lake and certainly not from the farming areas to the south where most of the sugarcane acreage and other valuable farm industries are located. Furthermore, according to the best scientific facts we can find, the concentration of nutrients in this local area runoff is also heavier than that of the lesser amounts of water coming in from the lake. This indicates the unbridled urban growth of the Treasure Coast region — much of it marching forward in environmentally sensitive areas further and further inland — is, in fact, contributing a great deal to the pollution causing the algae to grow in those local estuaries. This is in direct contrast with the political rhetoric that again is ending up in repetitive play on newsreels throughout South Florida right now as a result of Sunday’s event in Stuart. Recent events and political rallies like this one continue to prove several points I spoke about at the Marion County Farm Bureau annual meeting in Ocala recently. Even in a farm crowd, there was a lot of misunderstanding about facts vs. fiction in the wake of mainstream media misinformation being reported about South Florida algae. As I said at the Farm Bureau meeting, and as will be published in both Citrus Industry and VSCNews magazines this month and shared on our websites this week, this is probably the most misreported story I’ve ever witnessed in Florida. As for the Mast event, I didn’t feel very welcome, particularly after it was learned my newsbeat only focuses on agriculture issues, as it has for 40 years since earning my University of Florida journalism degree in 1978. It’s been a career endeavor, albeit sometimes a bit lonely in media circles, in search of the facts versus the fiction on issues like algae. But better factual reporting about agriculture is sorely needed, as an uninformed, emotional public too often buys into anti-agriculture rhetoric that leaves out critical details more often than not.